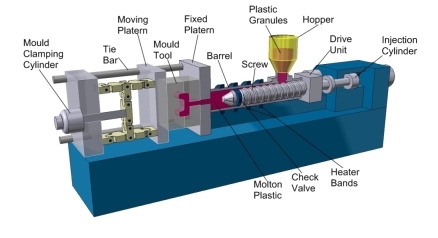 The clamping end with moving platen takes half of the mold tool ﻿﻿. This opens and closes the mold and supplies sufficient force to keep the mold closed when molten plastic is injected under pressure. The injection unit takes plastic raw material granules, heats them until molten, and injects them into the mold. Machines have a barrel that contains a screw (imagine a kitchen mincer), the barrel has heater bands around the outside which raises the temperature to the correct level to melt the plastic. The rotating screw forces the plastic along the barrel. This in turn forces the screw back as the molten material collects at the end of the screw. When the right amount of material for the next shot has accumulated the screw stops rotating. The screw then acts like a plunger moving forward and forcing the molten plastic into the mold tool.